The oil obtained from the fruit of the palm tree. It has a narrower plastic range than lard and most shortenings which is a disadvantage in shortening applications. It can be used in mixtures with only a moderately adverse effect on the plastic range. 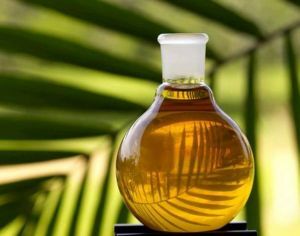 It consists mainly of palmitic, oleic, and linoleic fatty acids. It is used in margarine and shortenings. Many processed foods contain palm oil as an ingredient. The highly saturated nature of palm oil renders it solid at room temperature in temperate regions, making it a cheap substitute for butter in uses where solid fat is desirable, such as the making of pastry dough and baked goods: in this respect, it is less of a health-hazard than the alternative substitute of partially hydrogenated trans fat.